Running is such a good way for me to relieve stress. It give me time to think, to let thoughts run, to sing to myself, take stuff in, or just to do whatever. Unfortunately, I have gotten out of the habit. Cold weather certainly hasn't helped it. Today, after work, I decided I wanted to go running. I decided, even though it was only nine measly degrees outside, that I wanted to go running. I put on my running pants, my running shoes, my running shirt and my senior sweatshirt. Anyway, I put my ear buds in my ears, turned my ipod on to copeland, put my inhaler into my right pocket and my cell phone in my left. All was well. I did my usual stretches and made my way over to the rails to trails. I hopped on the trail and started going. Soon enough (and boy do I mean soon enough) my trail turned into packed snow. No, not ice, just packed snow. All of it. The whole thing. Lucky for me, apparently people still like this trail, even in the winter. There was a tiny little path that was just enough to run on. Unfortunately it was still packed snow, it was just more packed. Eventually it got a little bit rough to run on. I was pretty much just trying to place my feet in the feet holes provided by a previous passer by. My toes started to get really cold. I haven't even run a mile by this point, and my toes are starting to freeze. 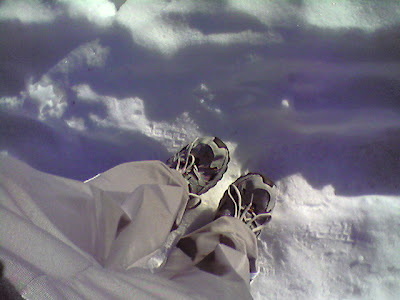 It was probably because of all the "not snow" that was attempting to mingle with my little toes. I pressed on. I bought my pants at target. They were only three bucks. Problem: they are mens small. Bigger problem: they kept slipping down as I ran. Luckily, I figured it was cold, so I wore long john like leggings. I kept stumbling and twisting my ankles. That was not fun. Then, of course, as my toes are freezing, my pants are falling, and my ankles are hurting, my ears start burning. Why is that? Well, my hood wouldn't stay on. Oh, did I mention my iPod died too? So now it's just me and the cold. I managed my way to a road and just ran home. So now I sit in a closet with wheezy breathing, defrosting toes, and ears that seem to be a lot warmer than usual. My ipod is charging and my phone is about to die. Words of wisdom: Don't run on the rails to trails in the winter. Instead just take the risk of getting hit by a car and take the road. Or run in place... in your house... where it is warm and you can just wear socks.